Chole= indian chick peas dish angeethi Herndon, originally uploaded by ShashiBellamkonda. What is special about this lunch buffet is the appetizer counter that you can get the chef to make Dahi bhalla, Bhel Puri or Papdi Chat right there for you. 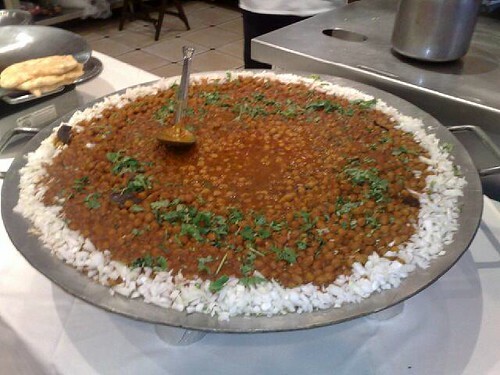 ( These are very typical snacks made famous on the Juhu beach in Bombay/Mumbai) I also like the Chole ( Indian Cheick peas dish) placed on this griddle very miuch like you would see in the markets in Delhi or Mumbai . This is eathen with fried bread called Bhatura ( also on the lunch buffet menu). Very good food and love the variety. Only peeve this lunch buffet had 4 dishes all red in color. As a chef myself I would have added a different dish to make the balance. of cource what's a Washington DC metro area indian buffet without Chicken Tikka Makhni or butter Chicken . Suggestion to these folks. Start a dosa counter too for people as part of the buffet.